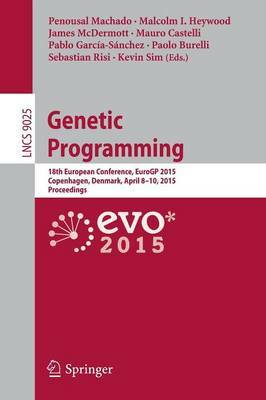 This book constitutes the refereed proceedings of the 18th European Conference on Genetic Programming, EuroGP 2015, held in Copenhagen, Spain, in April 2015 co-located with the Evo 2015 events, EvoCOP, Evo MUSART and Evo Applications. The 12 revised full papers presented together with 6 poster papers were carefully reviewed and selected form 36 submissions. The wide range of topics in this volume reflects the current state of research in the field. Thus, we see topics as diverse as semantic methods, recursive programs, grammatical methods, coevolution, Cartesian GP, feature selection, initialisation procedures, ensemble methods and search objectives; and applications including text processing, cryptography, numerical modelling, software parallelisation, creation and optimisation of circuits, multi-class classification, scheduling and artificial intelligence.